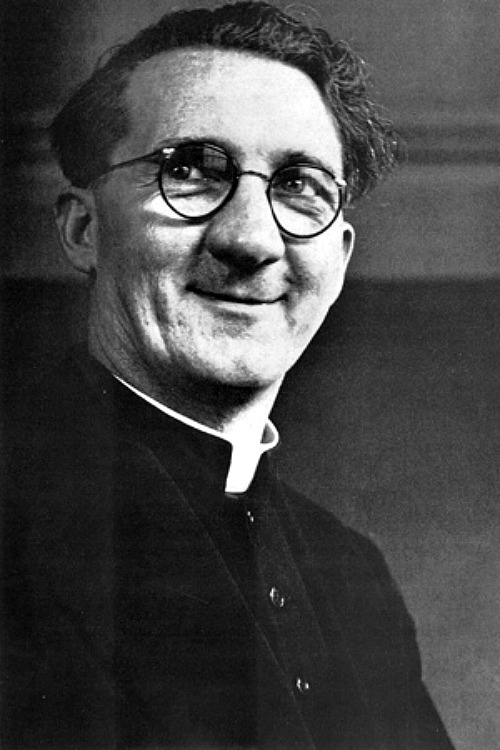 Monsignor Hugh O'Flaherty, was an Irish Roman Catholic priest, a senior official of the Roman Curia, and significant figure in Catholic resistance to Nazism. Although he was born in Kiskeam, where his mother's family were from, in North Cork, Monsignor Hugh O’Flaherty grew up in Killarney, where his father was the steward of the old Killarney Golf Club when it was located in Deerpark. By his late teens, young O'Flaherty had a scratch handicap and a scholarship to a teacher training college. However, in 1918 he enrolled at Mungret College, a Jesuit college in County Limerick dedicated to preparing young men for missionary priesthood. Normally, students ranged from 14 to 18 years of age. At the time when O'Flaherty came in, he was a bit older than most of the students, about 20. The college allowed for some older people to come in if they had been accepted by a bishop who would pay for them. Hugh O'Flaherty's sponsor was the Bishop of Cape Town, Cornelius O'Reilly, in whose diocese he would be posted to after ordination, a big step for a young man who had never stepped foot outside of Munster. He was posted to Rome in 1922 to finish his studies and was ordained on 20 December 1925. He would never join his diocese. He was a skilled diplomat and instead of going to Cape Town he stayed to work for the Holy See, serving as a Vatican diplomat in Egypt, Haiti, Santo Domingo, and Czechoslovakia. In 1934, he was appointed Monsignor. He was also devoted to golf, from his early years playing in Killarney while in Italy he played regularly with Count Ciano, Mussolini’s son-in-law, and with the ex-king Alfonso of Spain. His high standing in the social life of Rome would stand him in good stead during the Nazi occupation of Rome. Hugh O’Flaherty was from an Irish nationalist background. His views were formed when, as a young student in Limerick, he saw atrocities being carried out by Black and Tan soldiers from Britain and a number of his friends were killed. When the war began in 1939 he was understandably careful to avoid taking sides. However the Irishman’s views changed as the war developed, particularly after he learned of the violence being inflicted on Jews. In the early years of World War II, O'Flaherty toured prisoner of war (POW) camps in Italy and tried to find out about prisoners who had been reported missing in action. If he found them alive, he tried to reassure their families through Radio Vatican. In the autumn of 1942, the Germans and Italians began to crack down on prominent Italian Jews and aristocratic anti-fascists. Having socialised with these people before the war, the Monsignor now hid them in monasteries and convents, in his old college and in his own residence. When Italy changed sides in 1943, thousands of British POWs were released; however, when Germany imposed an occupation over Italy, they were in danger of recapture. Some of them, remembering visits by O'Flaherty, reached Rome and asked him for help. So in the spring of 1943, his operation broadened to include escaped British prisoners-of-war and shot-down allied airmen. He developed a network of safe apartments in Rome in which they could hide. Hugh O'Flaherty did not wait for permission from his superiors. He recruited the help of other priests (including two young New Zealanders Fathers Owen Snedden and John Flanagan), two agents working for the Free French, François de Vial and Yves Debroise, and even Communists and a Swiss count. One of his aides was British Major Sam Derry, a POW escapee. Derry along with British officers and escaped POWs Lieutenants Furman and Simpson, and Captain Byrnes, a Canadian, were responsible for the security and operational organisation. Hugh O'Flaherty and his allies concealed 4,000 escapees, mainly Allied soldiers and Jews, in flats, farms and convents. One of the first hideouts was beside the local SS headquarters. O'Flaherty and Derry coordinated all this. When outside the Vatican, O'Flaherty wore various disguises. The German occupiers tried to stop him and eventually they found out that the leader of the network was a priest. Lieutenant Colonel Herbert Kappler, the head of the SS Sicherheitsdienst and Gestapo in Rome learned of O'Flaherty's actions; he ordered a white line painted on the pavement at the opening of St. Peter`s Square (signifying the border between Vatican City and Italy), stating that the priest would be killed if he crossed it. Such was the German’s desire to stop his Irish rival that he tried to kidnap and kill the monsignor and even placed a bounty of 30,000 lire on his head. Ludwig Koch, head of the neo-Fascist Italian police in Rome often spoke of his intention to torture O'Flaherty before executing him, if he ever fell into his hands. Several others, including priests, nuns and lay people, worked in secret with O'Flaherty, and even hid refugees in their own private homes around Rome. Among these were Augustinian Maltese Fathers, Egidio Galea, Aurelio Borg, Ugolino Gatt and Brother Robert Pace of the Brothers of Christian Schools. Another person who contributed significantly to this operation was the Maltese-born widow Chetta Chevalier, who hid some refugees in her house with her children, and was lucky to escape detection. Jewish religious services were conducted in the Basilica di San Clemente, which was under Irish diplomatic protection, under a painting of Tobias. By the end of the war he had helped over 6,500 Jews, American and British Soldiers escape from the Germans. O'Flaherty demanded that German prisoners be treated properly as well. He took a plane to South Africa to meet Italian POWs and to Jerusalem to visit Jewish refugees. Of the 9,700 Jews in Rome, 1,007 had been shipped to Auschwitz. The rest were hidden, 5,000 of them by the official Church − 3,000 in Castel Gandolfo, 200 or 400 (estimates vary) as "members" of the Palatine Guard and some 1,500 in monasteries, convents and colleges. The remaining 3,700 were hidden in private homes. At the time of the liberation of Rome, Hugh O'Flaherty's and Major Sam Derry's organisation was caring for 3,925 escapees and men who had succeeded in evading arrest. Of these 1,695 were British, 896 South African, 429 Russian, 425 Greek and 185 American. The remainder were from 20 different nations. This does not include Jews and sundry other men and women who were in O'Flaherty's strictly personal care. After the war the Monsignor received many decorations, including, Commander of the British Empire and the US Medal of Freedom. He regularly visited his old nemesis Colonel Herbert Kappler (the former SS chief in Rome) in prison, month after month, being Kappler's only visitor. The classical singer Veronica Dunne, who knew the monsignor, remembers Mgr O’Flaherty meeting Kappler. It seems the feeling was mutual as Kappler would describe Mgr O’Flaherty as “a fatherly friend”. At this stage Kappler, who had been raised as Protestant, was considering becoming a Catholic and was influenced by his former rival. In 1959, Kappler converted to Catholicism and was baptised by O'Flaherty. A nephew of the monsignor, the former Irish Supreme Court judge who is also called Hugh O’Flaherty, says his uncle urged Kappler to delay his conversion until the trial was concluded. “My uncle advised him that it would be construed as if he was trying to curry favor,” he says. Kappler waited until he was sentenced and then called on the monsignor to visit him. The two men prayed together and then Mgr O’Flaherty received Kappler into the Catholic Church. In a matter of minutes, Italy’s most notorious Nazi was welcomed into the faith by the very man he had tried to kill. In 1960, O'Flaherty suffered a serious stroke during Mass and was forced to return to Ireland. Shortly before his first stroke in 1960, he was due to be confirmed as the Papal Nuncio to Tanzania. The Monsignor retired to Cahirciveen to live with his sister for the last three years of his life and on 30th October, 1963 he sadly passed away, aged 65. His death was mourned throughout the world, including a front page tribute in the New York Times. His popularity and fame and his wide circle of friends meant that the village of Caherciveen in County Kerry witnessed the biggest funeral it had ever seen. Representatives from the Catholic Church and officials from the British and Irish governments and friends from his days in Rome were among the mourners. He was buried in the cemetery of the Daniel O'Connell Memorial Church in Cahersiveen. There is a grove of Hugh O'Flaherty Trees in the Killarney National Park. O'Flaherty was portrayed by Gregory Peck in the 1983 television film, The Scarlet and the Black, which follows the exploits of O'Flaherty from the German occupation of Rome to its liberation by the Allies. There is a statue of Father Monsignor Hugh O`Flaherty in his home town of Killarney. The memorial was unveiled on October 30th 2013. Sculpted by Alan Ryan Hall from Valentia, County Kerry.